I admit it was the subject matter that prompted me to pick up this book, but I was disappointed. If anything, The Last Party is a much better chronicle of 54's history than that Michael Myers film, but it is essentially a slow-moving story. That doesn't sound like a four-star review I'd write, so when I see Party has been re-released this year and slightly updated, I figure why not re-familiarize myself with the story and see if my opinion has changed. Journalist Haden-Guest (half-brother of Spinal Tap's Christopher) may be better known in some circles as a frequent guest, and while The Last Party chronicles the "Nightworld" as a whole - its early chapters a brief guide to popular discos of the time - it's clear in the 70s there was only place to party. 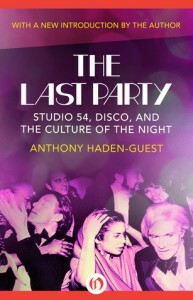 Party, though, isn't exclusive to Studio 54. Studio is perhaps the best known of the New York clubs that thrived in the brief disco era, but Haden-Guest touches on a myriad of imitators and (often unsuccessful) competitors. Party reads like a hybrid of micro-history and memoir, as Haden-Guest injects his personal experience in numerous vignettes within the book. It's a muddled story that plows through Studio 54, which enjoyed a life akin to a shooting star - an incredibly bright flame out and gradual fizzle into darkness. As you read a book like this, you might expect gossip to turn your hair white. You get snatches (heh) of it, but overall the book is a roll call of club promoters, developers, and people who are more New York/nightlife famous than world famous. There's a lot to muddle through and if you stick with Party you may ask yourself how a book about a place once considered the most exciting on the planet comes off so dull. Yes, the slow-moving assessment remains. The book isn't much of a party for me, but you're into peeling back glitter for the seamy underbelly of nightlife you'll get more tales of creative accounting than blind item coke snorting here.